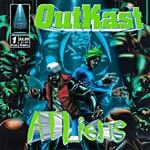 My favorite Outkast album. This is so classic that if you touch it you will turn into platinum! Maybe a little bit of exaggeration but this album is so solid that nothing will ever be able to break it. 1,2,5,8,9,10,11,12,14 and 15 produced by Organized Noize. 3,4,6,7,13 produced by Outkast.